Ask any well-traveled rail photographer to list their top five states for shooting, and the odds are pretty good that Colorado will appear on that list. With the spectacular Front Range of the Rockies just outside Denver, a busy multi-railroad line heading down to Pueblo and some of the best tourist railroads in the land, Colorado has quite the variety. 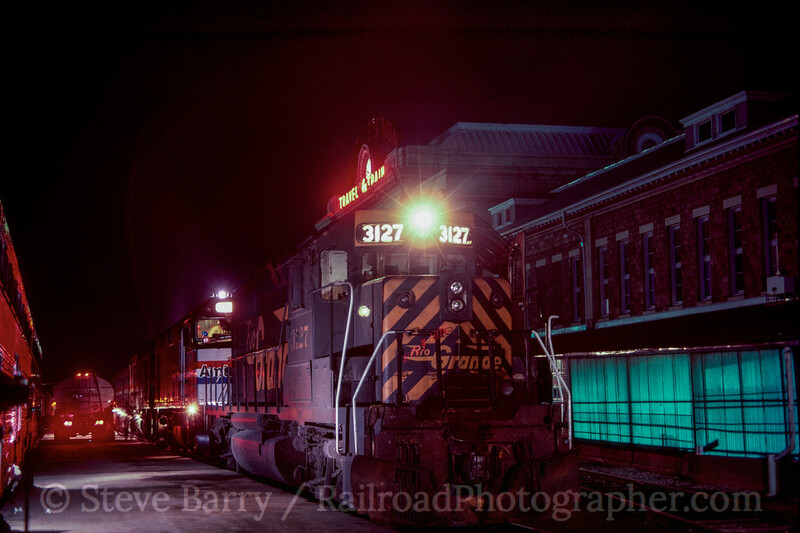 My first visit to Colorado was in 1982 to attend the convention of the National Railway Historical Society. I didn't have a car for that trip, so non-convention photos are rare. 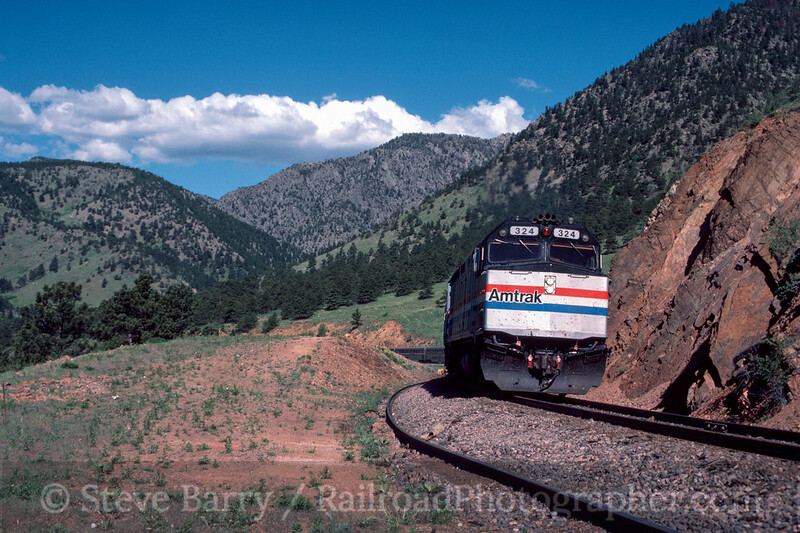 But I returned in 1985 to ride a trip behind Union Pacific's Challenger No. 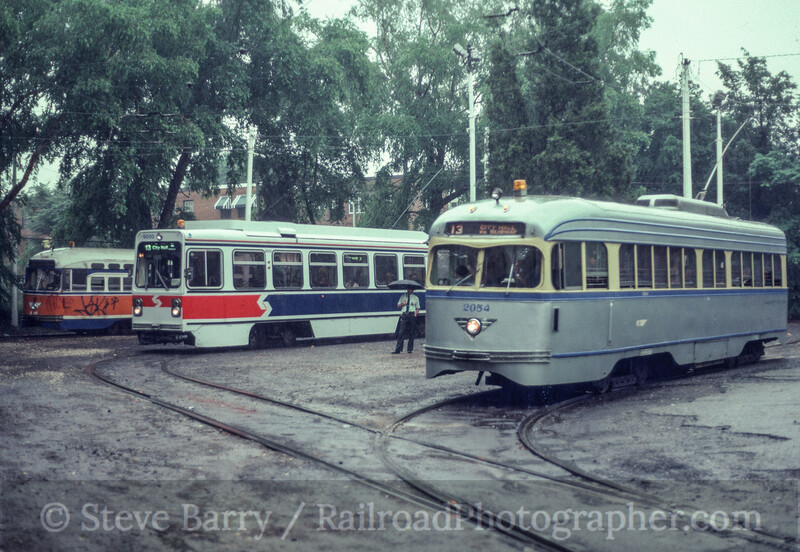 3985 (we did a post on that earlier) and again in 1988 to attend the 50th Anniversary of the Rocky Mountain Railroad Club. 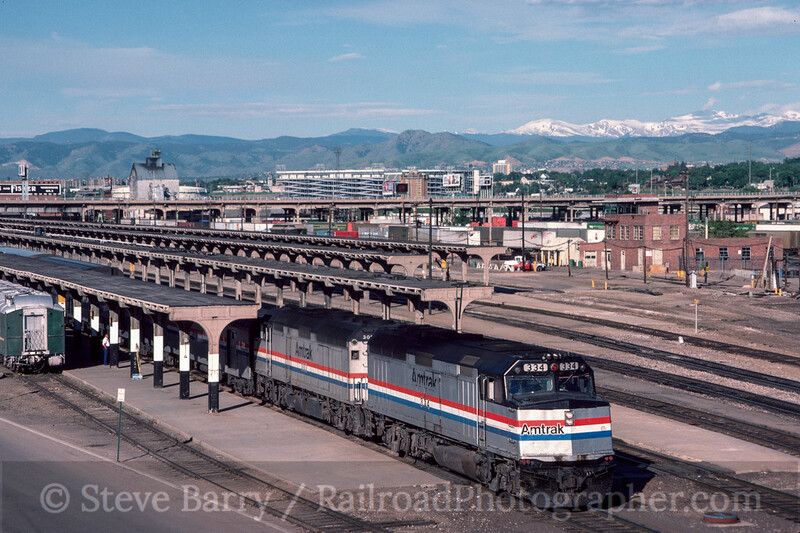 We'll concentrate this post on the middle trip, starting in Denver Union Station in 1985 (above). Next, we're following Amtrak's westbound California Zephyr into the Front Range. It is about to enter the first of over two dozen tunnels on its climb up the Rockies, which will ultimately top out inside Moffatt Tunnel. 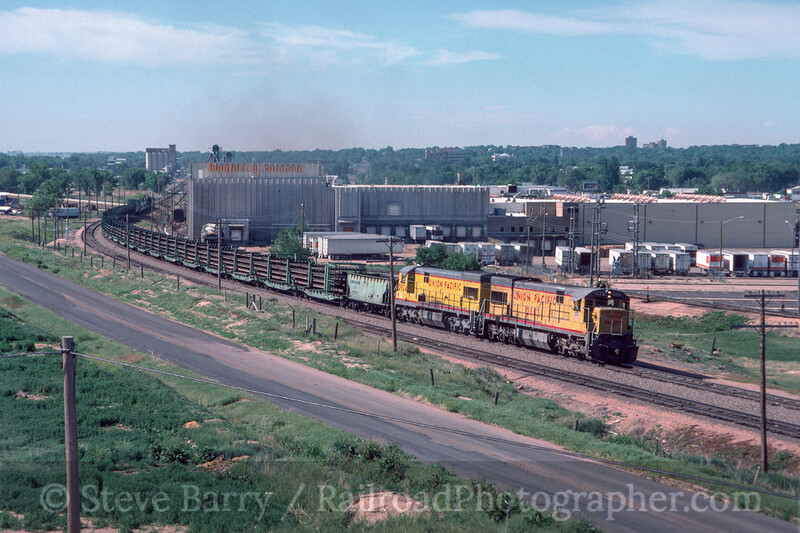 Next, we'll follow Union Pacific north out of Denver towards Cheyenne, Wyo. We see a northbound rail train passing the Monfort meat packing plant. Back at Union Station in Denver, we find the eastbound California Zephyr pausing just after sunset. The descent down the Rockies was made as twilight consumed the plains and the lights of Denver started flickering on in the distance. The Denver & Rio Grande Western, the host railroad for the Zephyr on this leg of the trip, added a freight locomotive for braking down the grade from Moffatt. Heading south from Denver, we are on the Joint Line to Pueblo. 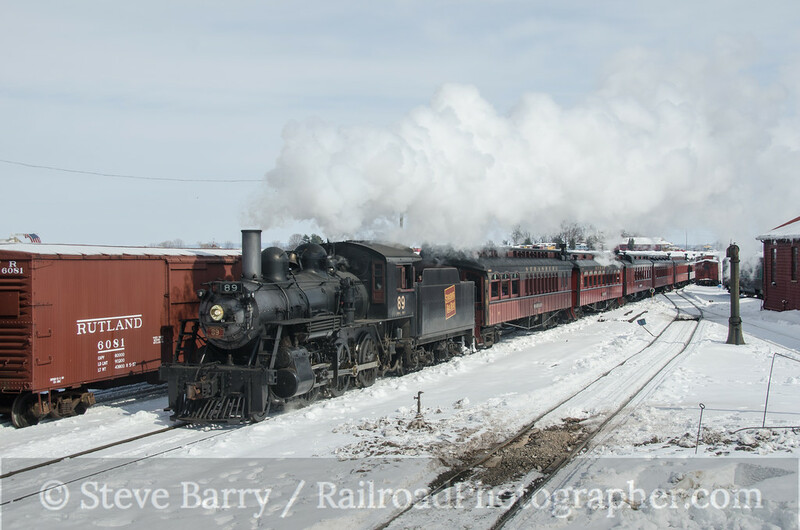 The Joint Line is so named because trains from the Rio Grande, Burlington Northern and Atchison, Topeka & Santa Fe all used the tracks at this time. 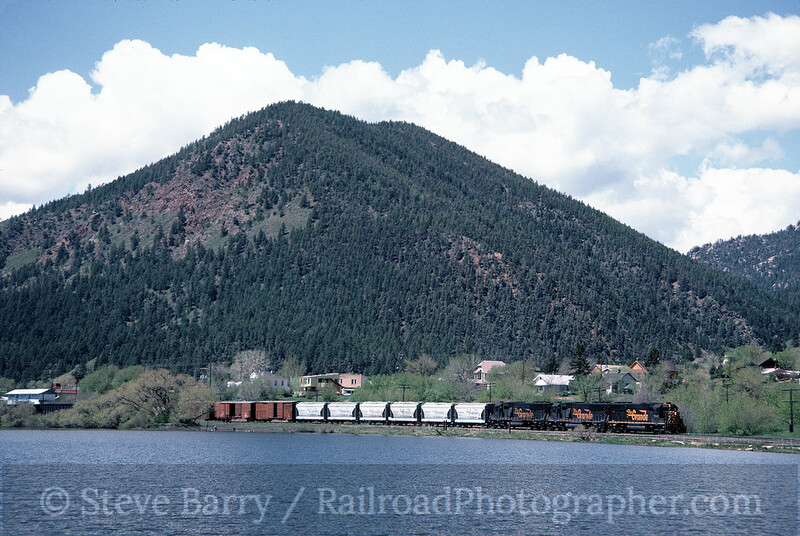 A northbound Rio Grande freight was spotted along the shores of Palmer Lake. 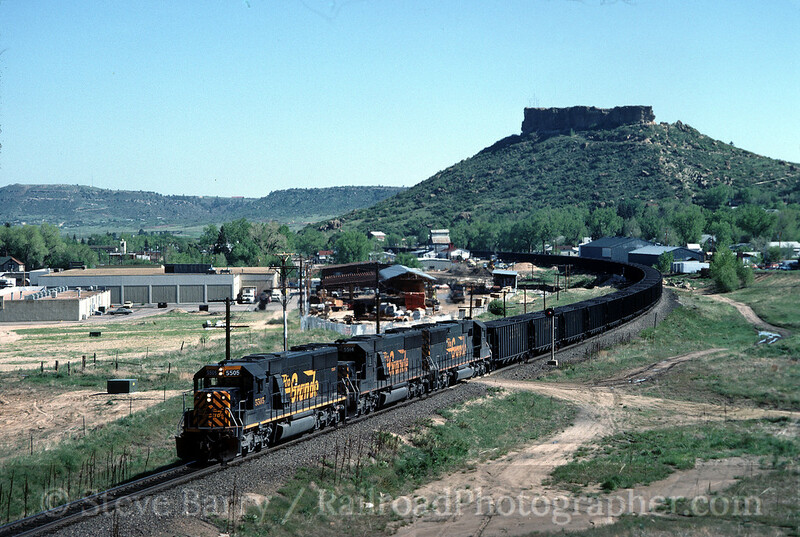 Still on the Joint Line, we see a southbound train at Castle Rock behind a trio of the Rio Grande's way cool SD50 locomotives. The Joint Line was built as two different parallel railroads (Rio Grande and Santa Fe), but consolidation led to the railroads sharing the tracks with Rio Grande's line being used for northbound trains and the Santa Fe's for southbounds. This southbound Rio Grande train was actually running on the northbound track, which lined it up quite nicely with Castle Rock. The Rio Grande had some interesting names along its route. West of Moffatt Tunnel was one of my favorites. 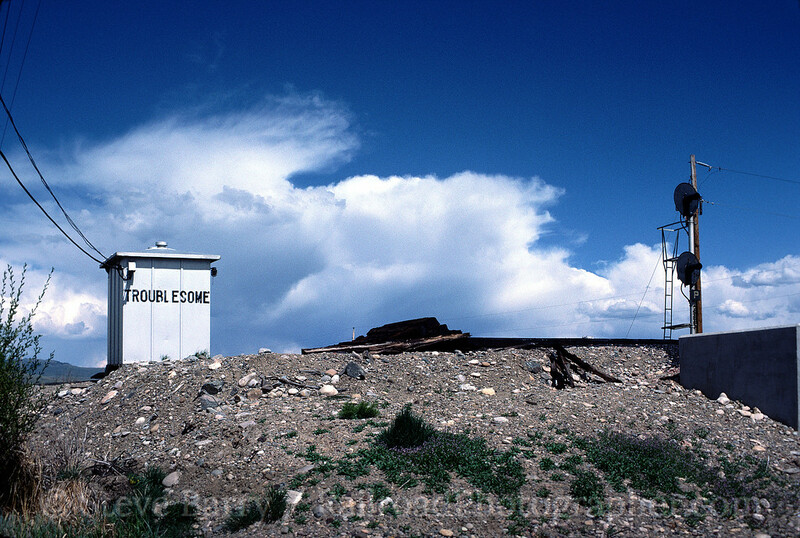 We finish our visit to Colorado in 1985 with a stop at Troublesome. 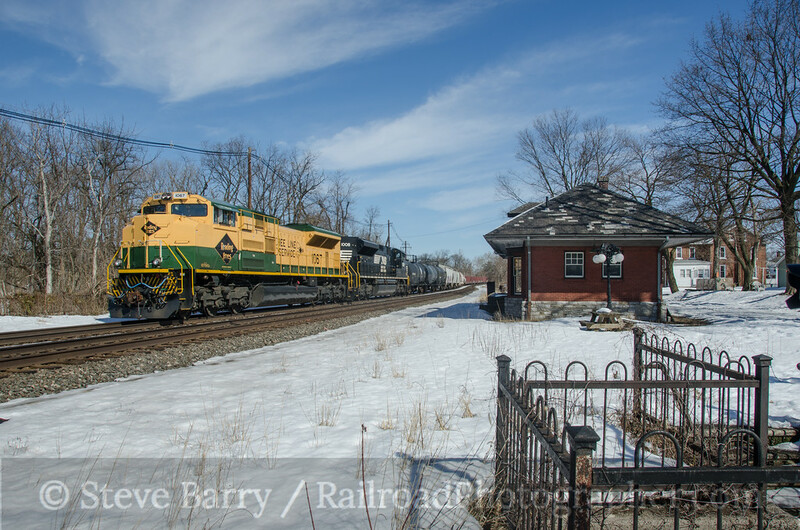 Saturday, February 22, had a forecast of bright and sunny, and with a handful of Norfolk Southern's heritage units roaming eastern Pennsylvania, I headed into the Keystone State in search of some colorful diesels. The website for monitoring these locomotives, heritage units.com, showed nothing specific happening, but the odds were good that something would break loose at some point. I was driving for a rendezvous with my brother Bruce and Mike Burkhart in Harrisburg when Mike called. 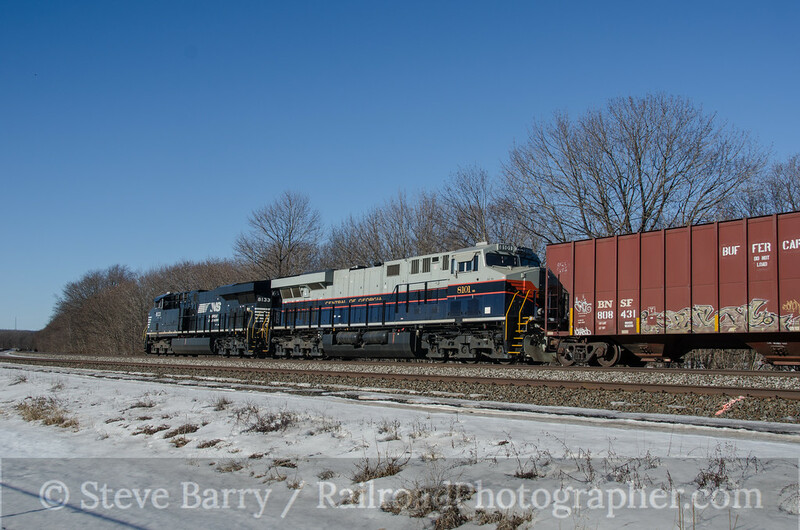 The Reading heritage unit had made an unexpected appearance on a westbound freight (after conflicting reports on its location the previous day). 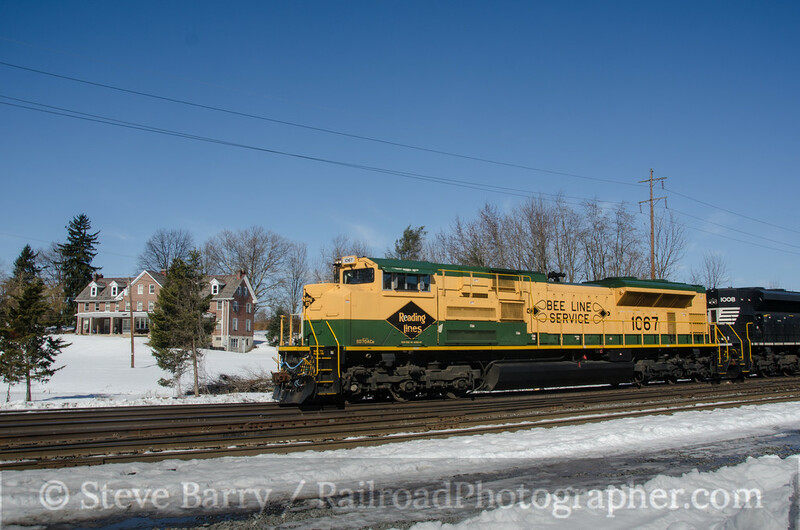 With this info, the three of us converged on Hershey, Pa., where the tracks head southward, allowing good light on a westbound train in the morning. 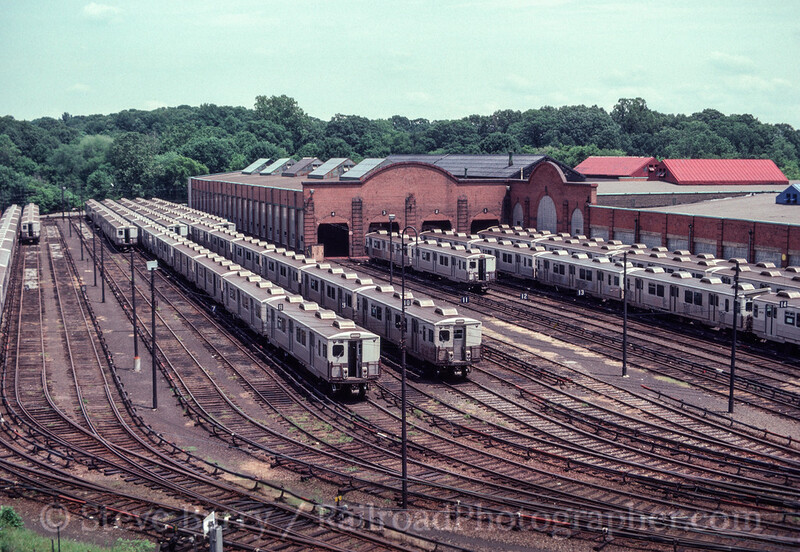 As an added bonus, we'd be shooting the Reading unit on former Reading Company trackage. I got to Hershey first and found the Norfolk Southern local switching the yard that serves the famous chocolate plant (at least what's left of it -- many of the Hershey factory buildings have been recently demolished). NS GP38-2 No. 5659 was doing the work in the yard. 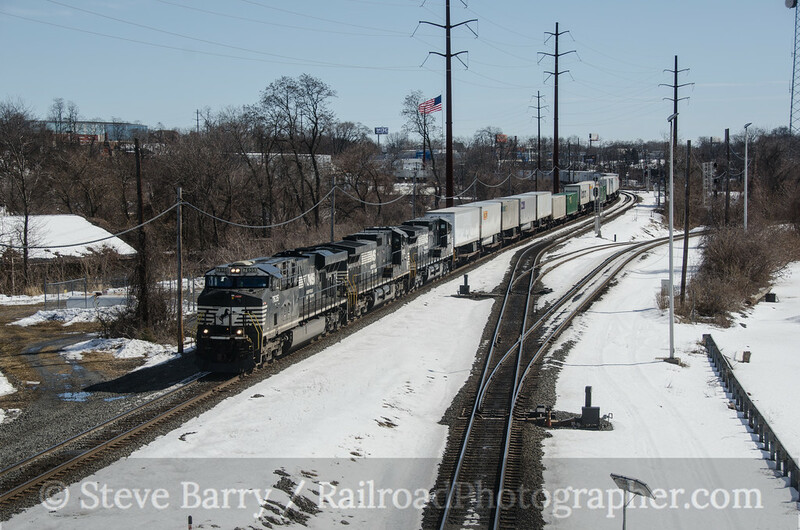 A number of freight passed through Hershey before the arrival of train 19G with the Reading unit. While the light favored westbounds, eastbound trains also looked good passing through the wreckage of some of the Hershey plant. As the morning wore on, the crowd in Hershey kept growing and growing as train time for 19G neared. Finally 19G showed up with SD70ACe No. 1067 in Reading colors on the point. The train had to make a setoff in the Hershey yard. 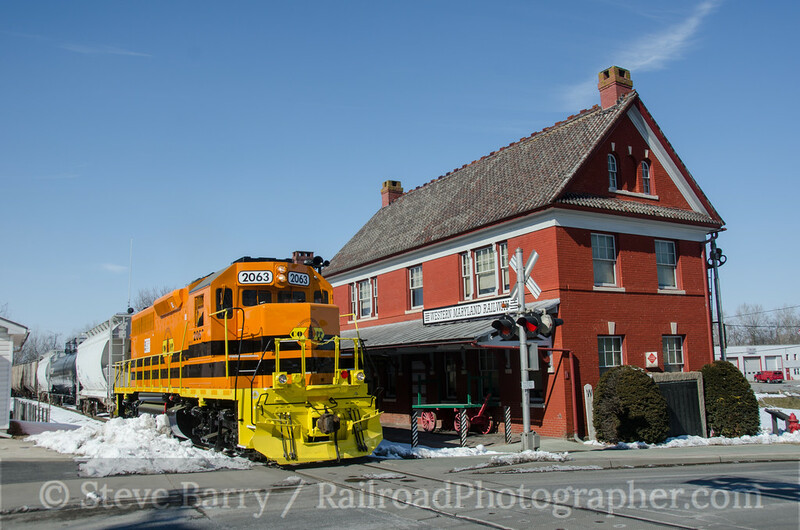 As the train was being put back together to go west, we relocated to a former Reading station on the west side of Hershey. We might as well get some of the old Reading with the new Reading! As the train approached Rutherford yard it hit some traffic that delayed it. We knew it would have to stop on the fuel pad in Harrisburg for a crew change and fuel, so we set up in Harrisburg just east of the fuel pad. Our train was badly delayed, but we did get an intermodal train heading west out of Rutherford. Meanwhile, just to our right in the above shot, an oil train started heading west with the NS Central of Georgia heritage unit as the second locomotive. 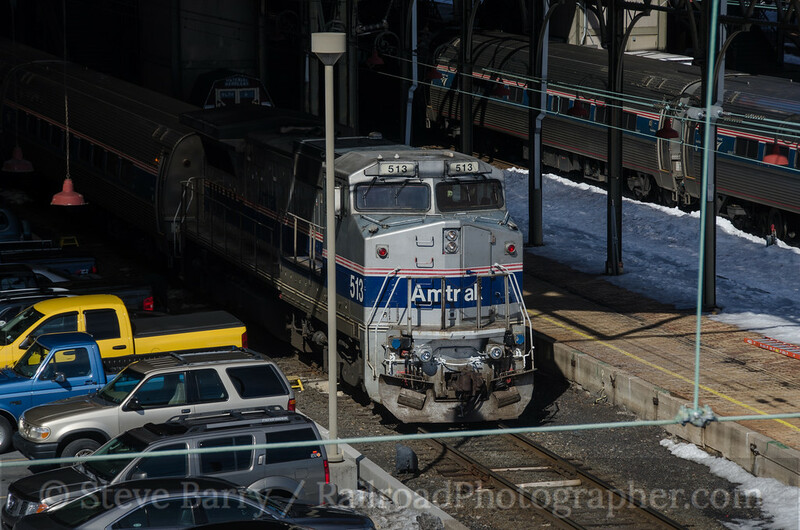 And just to our backs from the same bridge, Amtrak's eastbound Pennsylvanian was stopping in the Harrisburg station. 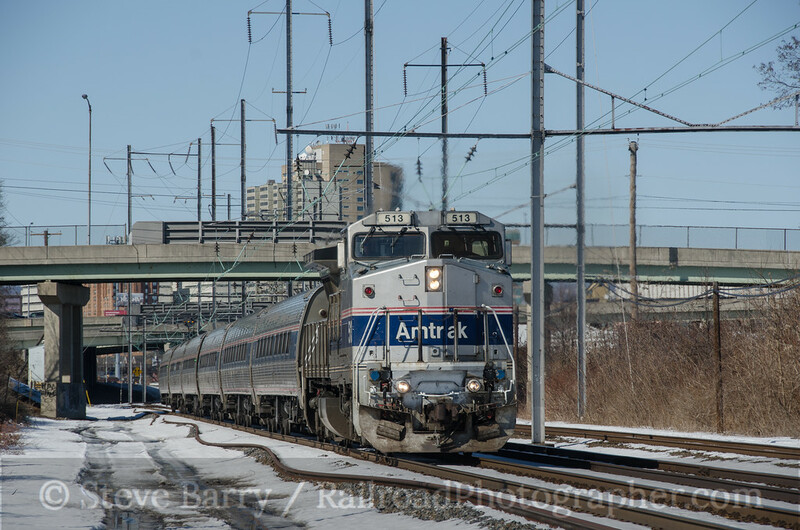 With our Reading unit still stuck in traffic, we relocated onto Amtrak's Harrisburg-Philadelphia line and got the eastbound Pennsylvanian again. 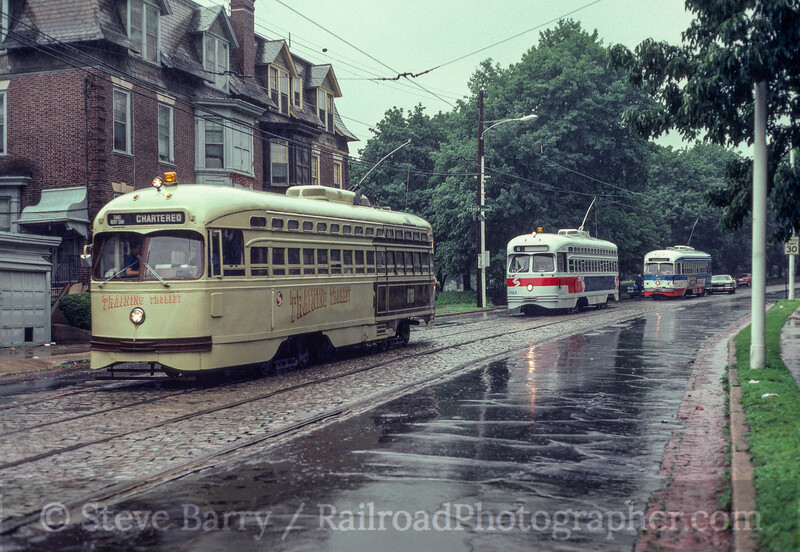 Both of the Pennsylvanians this day would have somewhat rare B32-8 locomotives leading, with eastbound No. 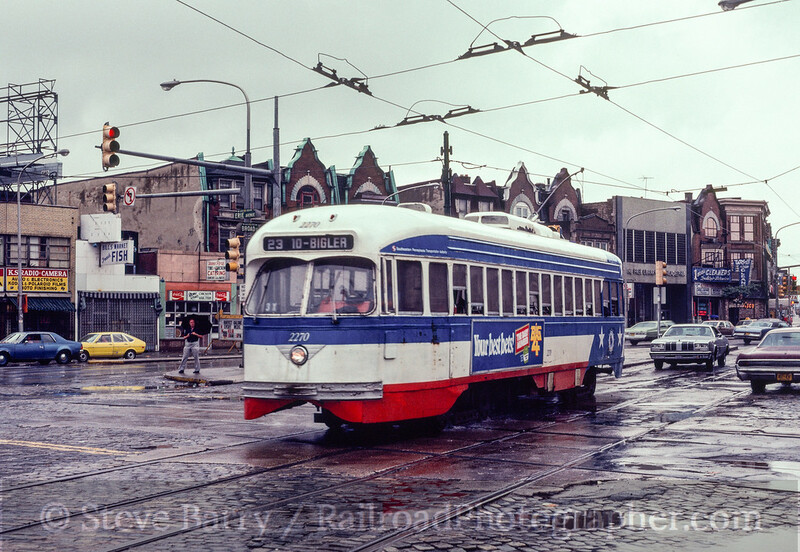 513 sporting the attractive Northeast Direct paint scheme. Our train still hadn't made it to the fuel pad, so we worked our way west now following the former Pennsylvania Railroad main line knowing the westbound Pennsylvanian would soon be in the picture. As we headed west on Route 15, we caught up to the rear of the oil train with the Central of Georgia unit. We thought we would overtake it, but it accelerated and left us behind poking along in traffic. This meant it was time for lunch and to regroup so we grabbed some subs at the Sheetz in Cove, then headed west to Newport to enjoy our lunch trackside. At Duncannon we passed the oil train stopped, and noticed a lot of other stopped trains. 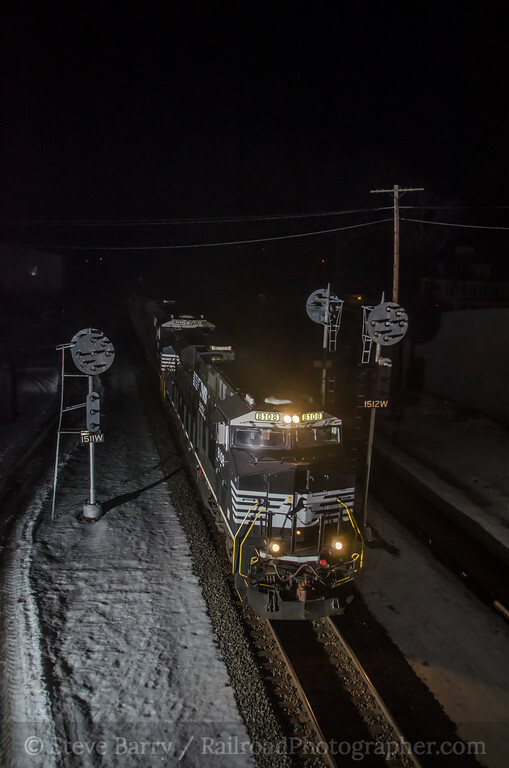 System-wide, Norfolk Southern's dispatching center had shut down and just about every NS train in the country was at a standstill. 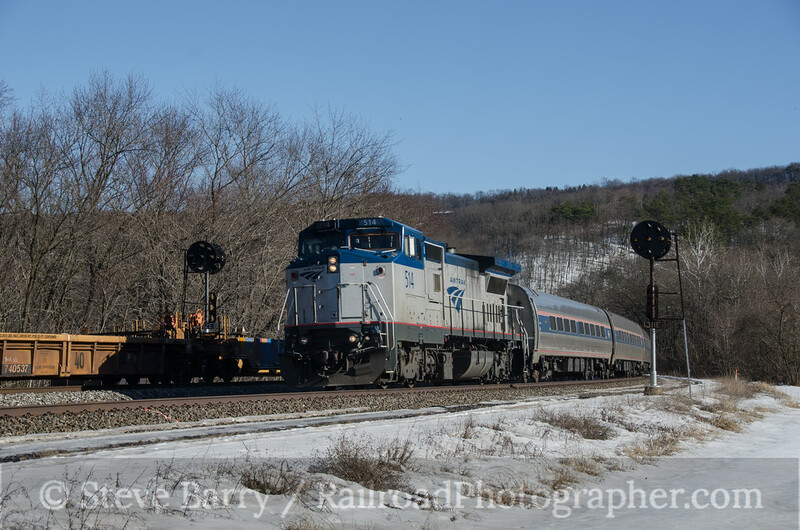 The outage lasted about 90 minutes, and when trains started rolling again, the first one we saw at Newport was the westbound Pennsylvanian. Our train still hadn't made the fuel pad in Harrisburg, so we busied ourselves shooting trains with old Pennsylvania Railroad signals (which are being replaced) around Newport. Our westbound Pennsylvanian shot featured the train splitting a pair of signals (above) on the east side of Newport, and it was shortly followed by the delayed oil train with the Central of Georgia heritage unit. 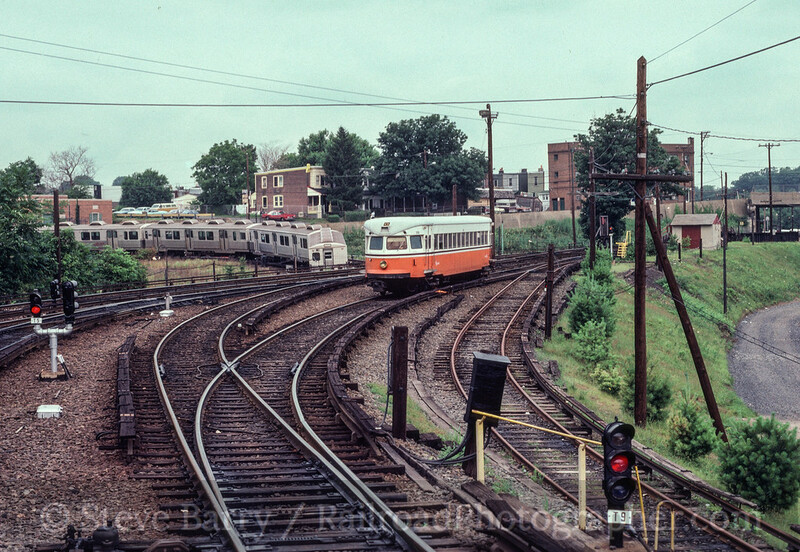 We then relocated to the west side of Newport where we got an eastbound train under the ex-Pennsy signal bridge. Finally the train with the Reading unit made the fuel pad, had gassed up and was heading west. 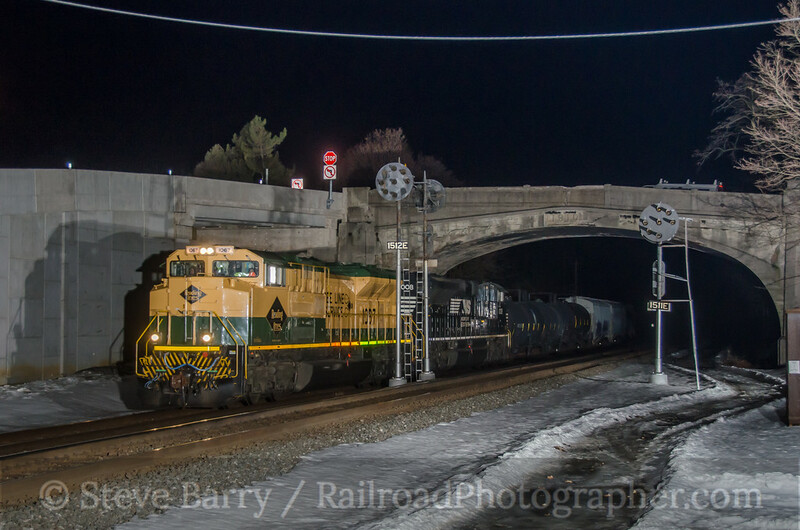 The timing was actually pretty good, as it would allow for a night photo passing the Pennsy signals at Port Royal. 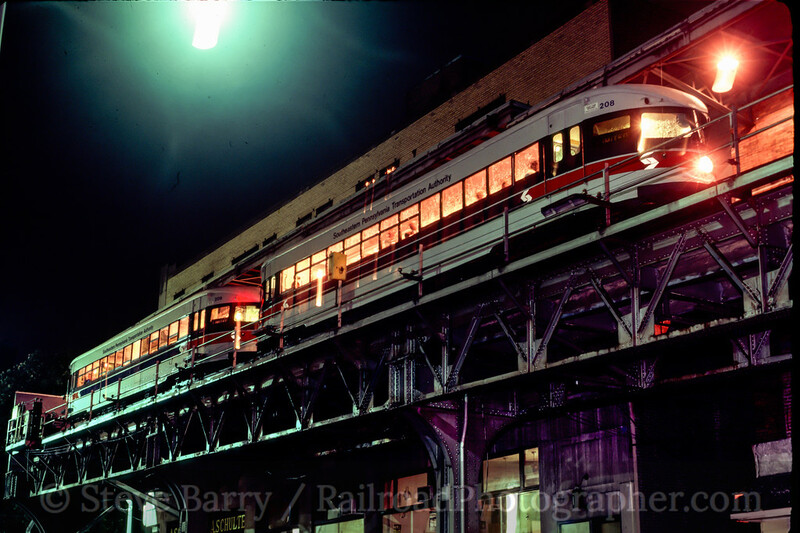 We headed there and set up our strobes, and it wasn't long before the train went by. 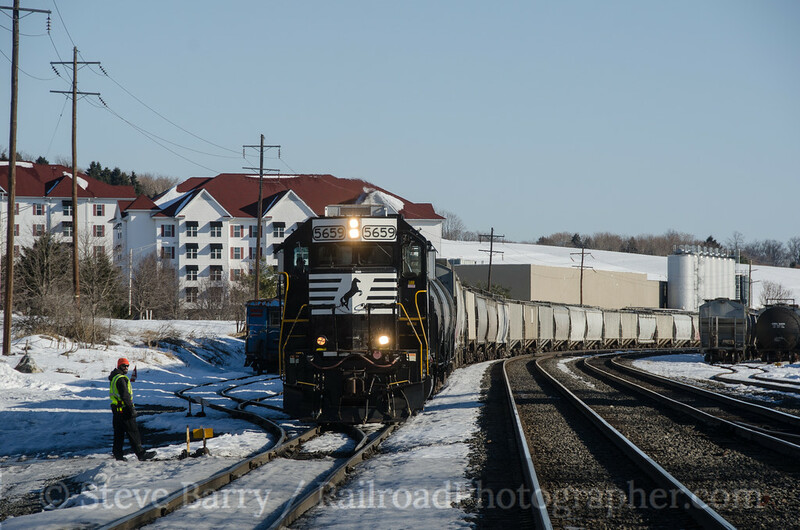 Norfolk Southern; Port Royal, Pa.
We ended our chase here. 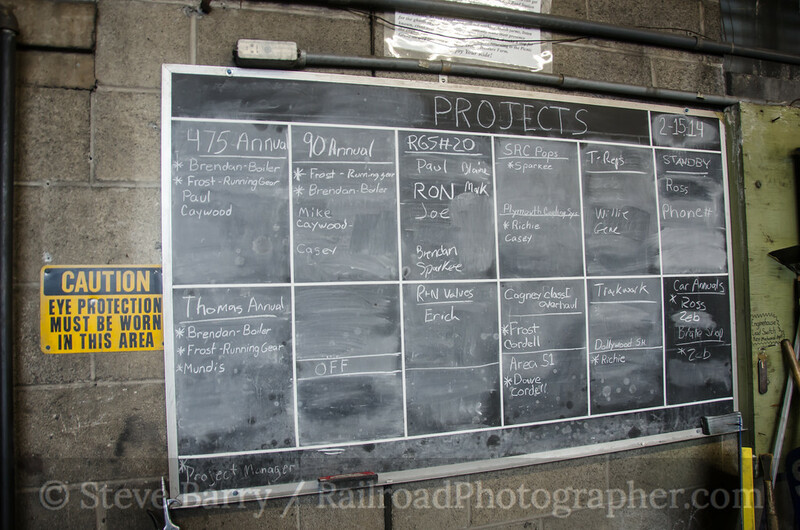 In all, we had followed the Reading unit for about 55 miles from Hershey to Port Royal, and it took the train eight hours to cover that distance (and 40 of those 55 miles were done in the last hour, between leaving the fuel pad and getting to Port Royal). It wasn't exactly a high speed chase. The night was still somewhat young, so we decided to try for an eastbound train at Port Royal passing the Pennsy signals. We relocated to the overpass and were rewarded with several trains. 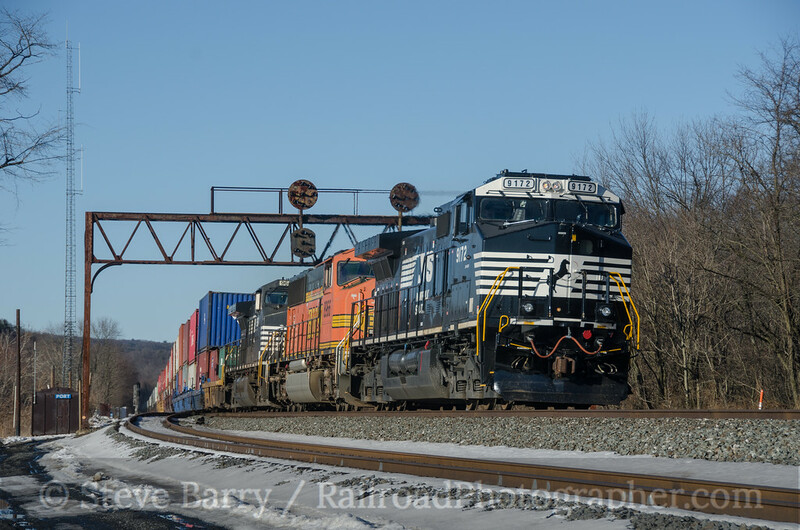 It was a busy evening on the former Pennsylvania Railroad main line and a great way to end a great day. You can find more photos from the day here. 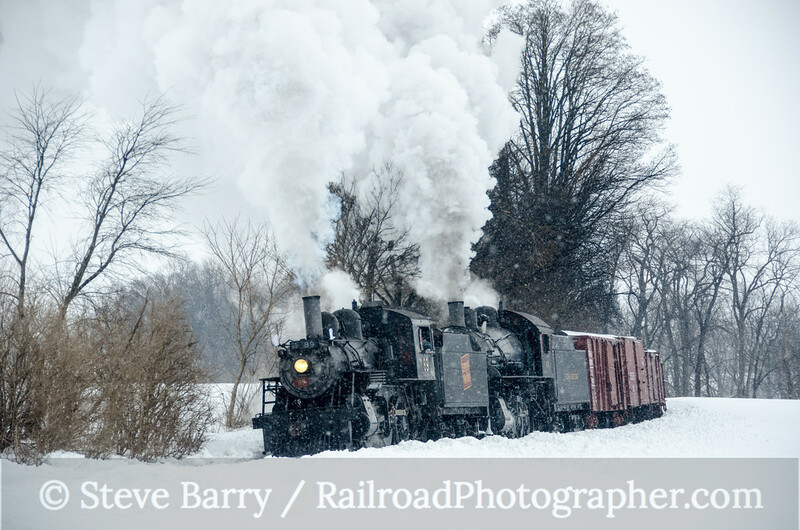 The Strasburg Rail Road in Lancaster County in Pennsylvania has been a favorite for photo charters for several years now. 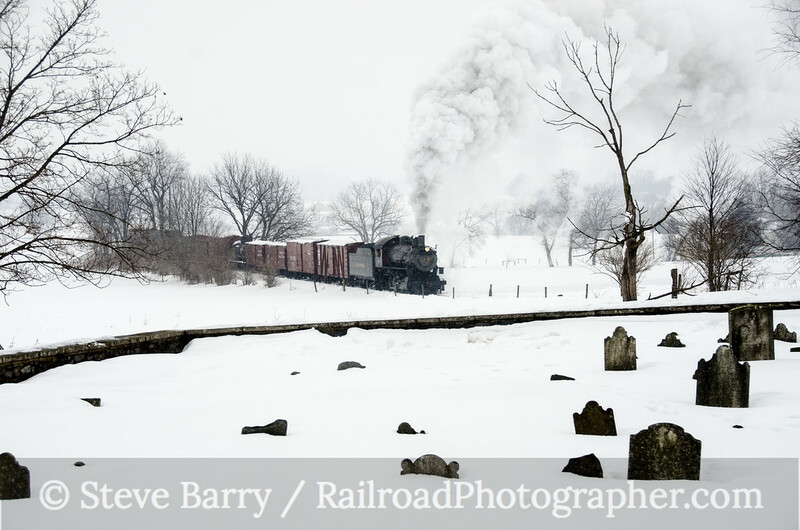 With a nifty roster of four locomotives and an impressive fleet of vintage freight cars, it provides one of the best photo charter opportunities in the eastern United States. Winter charters are particular favorites, hoping for falling snow or at least snow on the ground. Lancaster County usually doesn't get significant snow fall in the winter, so getting snow when you want it is rare, and even snow covering the ground is present for maybe ten per cent of the days in winter. 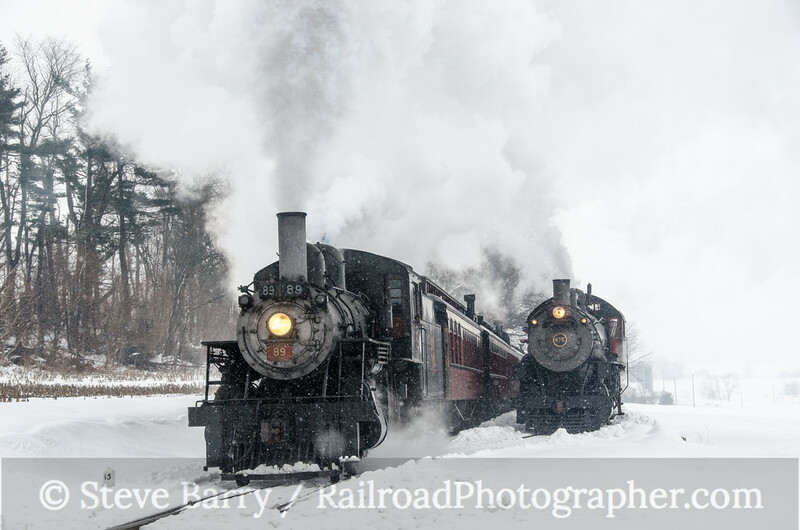 Even with those odds, two excursions in the past few years have been held with significant accumulations on the frozen fields, with one of those occurring on February 15 of this year. 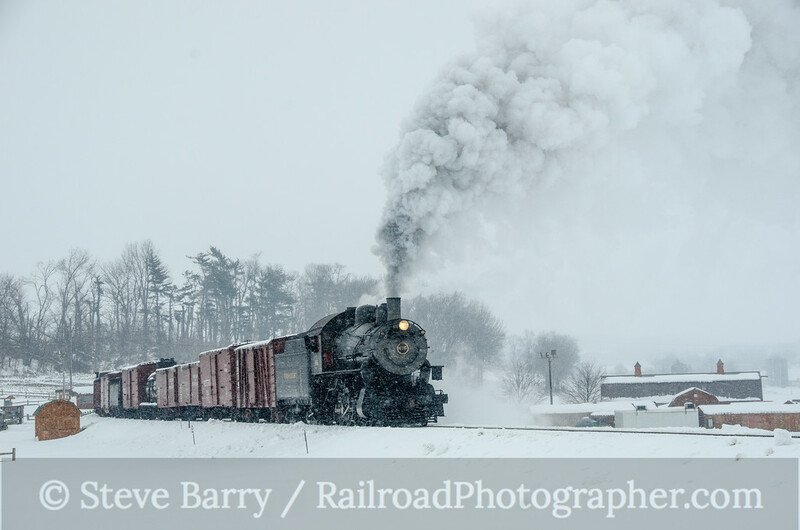 A nor'easter dumped a lot of snow on Strasburg on Thursday into Friday for the Saturday charter sponsored by Carl Franz. Power for the trip was ex-Norfolk & Western 4-8-0 No. 475, with a guest appearance by ex-Canadian National 2-6-0 No. 89. And as an added bonus, more snow fell during the day. 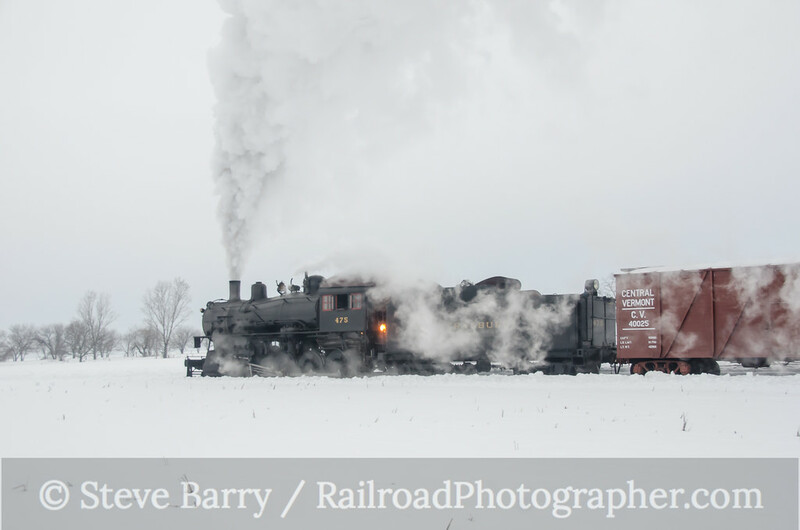 The first runbys were held just after sunrise (not that you could tell, as significant cloud cover accompanied the snow throughout the day) with the warm glow of 475's firebox visible (above). We'll take a quick look at the photos from the day with minimal commentary. 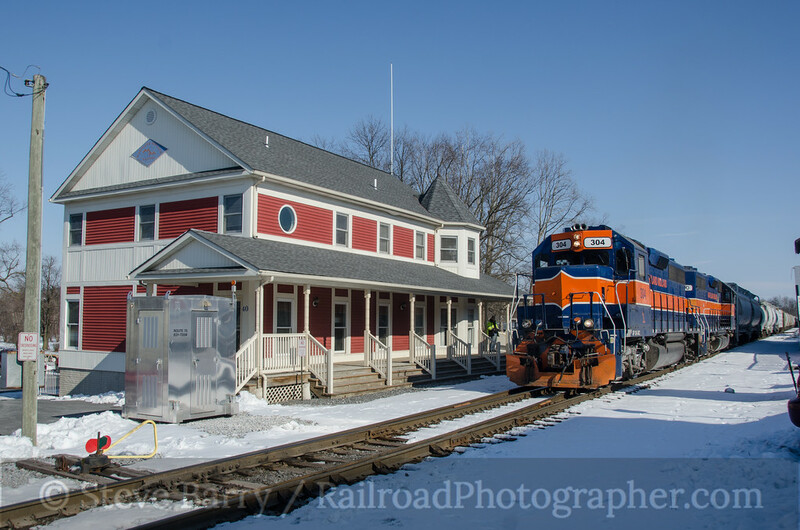 Just after 8:00 a.m. the special proceeded to Leaman Place Junction in Paradise, where the Strasburg connects with Amtrak's Keystone Corridor. 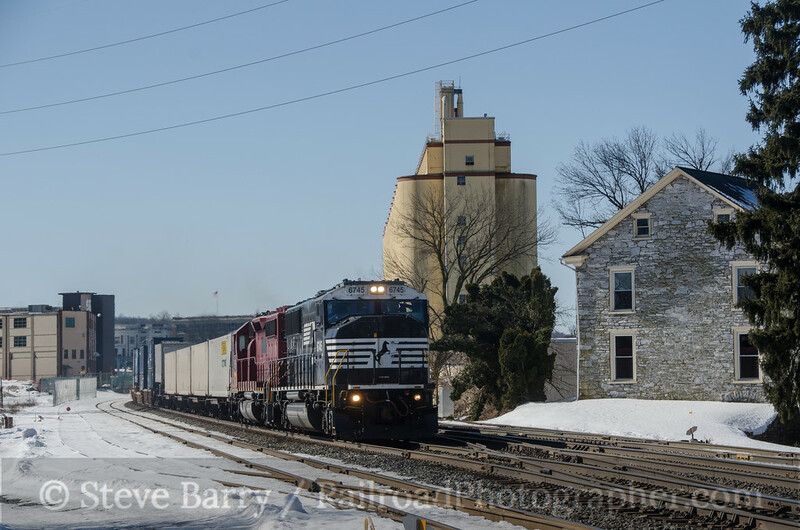 A train heading from Harrisburg to Philadelphia and New York made an appearance at the junction. The Strasburg dispatched No. 89 to join in the fun, so it performed a few doubleheaders with 475. No. 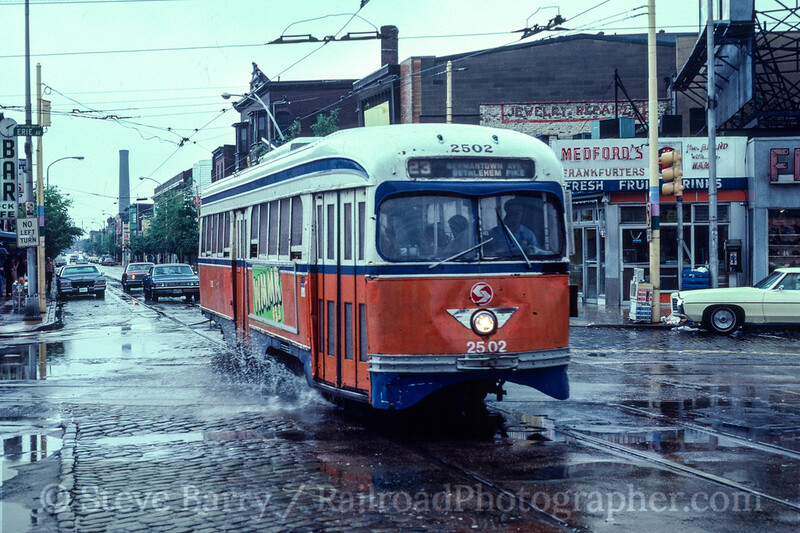 89 would be the power for the regular passenger trains later in the day. A prime photo location on the Strasburg is a new bridge that was opened in 2011. It made a nice broadside shot for the doubleheader. The cemetery at Carpenters Crossing was pretty much buried in snow. A lunchtime warmup provided an opportunity to check out the Strasburg shop. 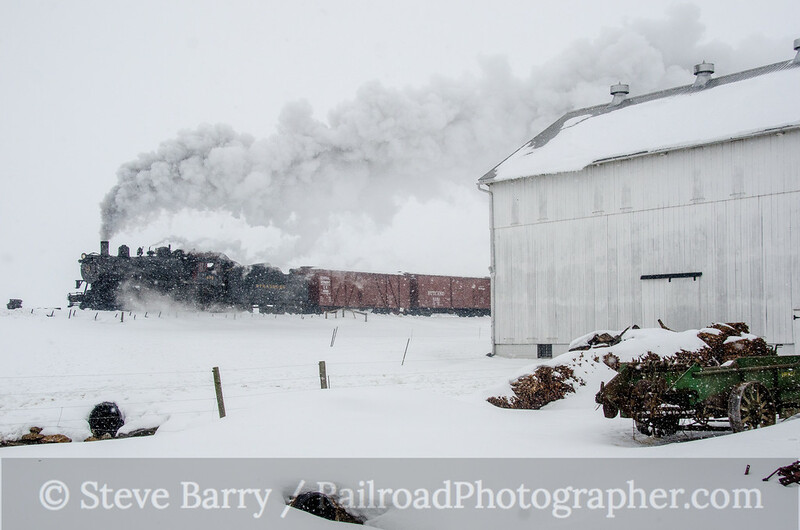 On the board is work for Strasburg 475 and 2-10-0 No. 90, an overhaul for Strasburg;s miniature Cagney locomotive, contract work on Rio Grande Southern 2-6-0 No. 20 and for Dollywood and even an annual inspection on Thomas the Tank Engine! 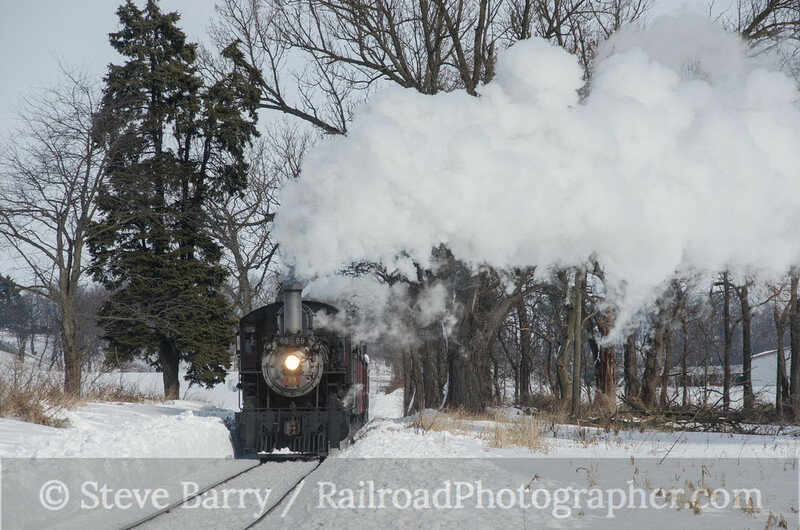 After lunch the charter train had to work around the regular passenger train. CN No. 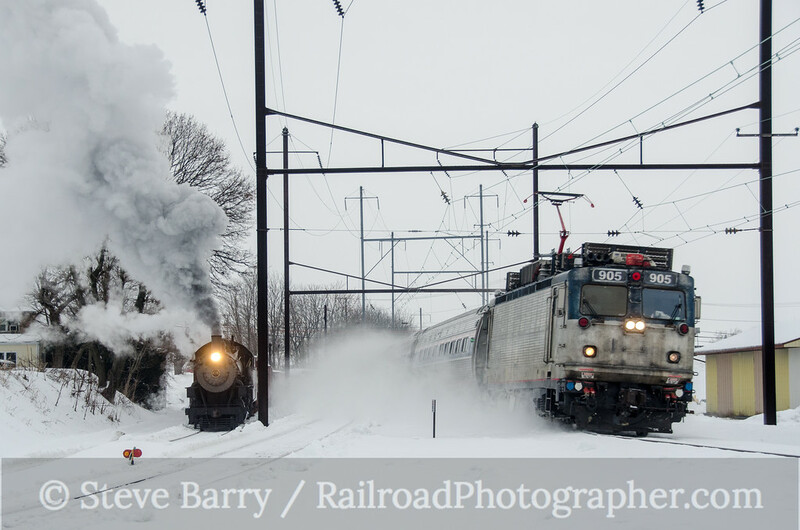 89 put on quite a bonus runby for photographers as it passed the freight at Cherry Hill. More snow was falling as No. 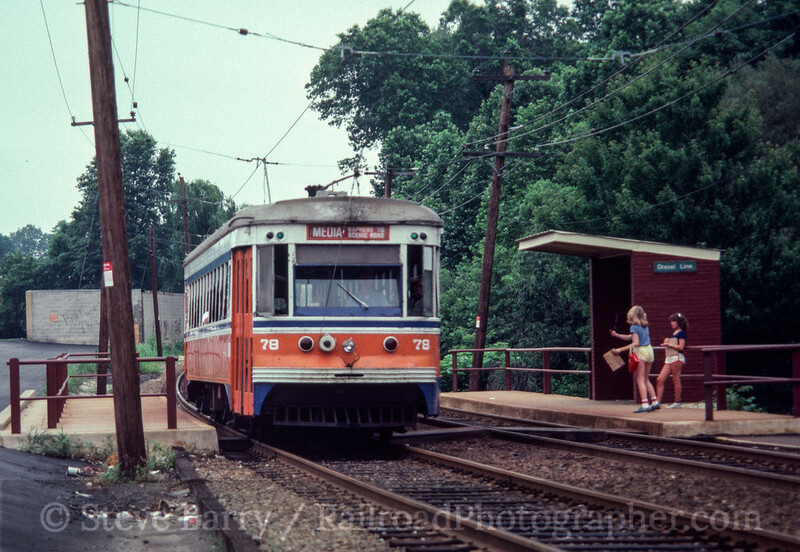 475 made a runby at Cherry Crest Farm at Cherry Hill. The farm is a popular petting zoo in the warmer months and a very popular corn maze in the fall. 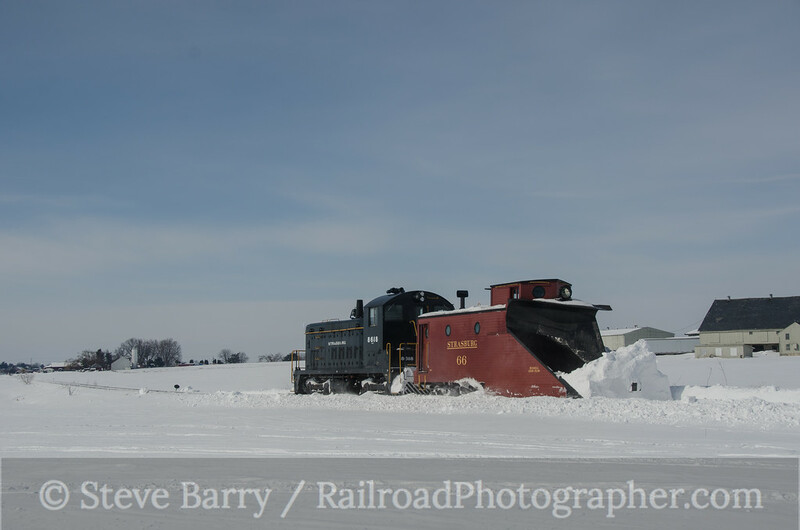 Blowing snow overnight meant that for the second time in three days the Strasburg would need to run a snow plow to clear the line. While No. 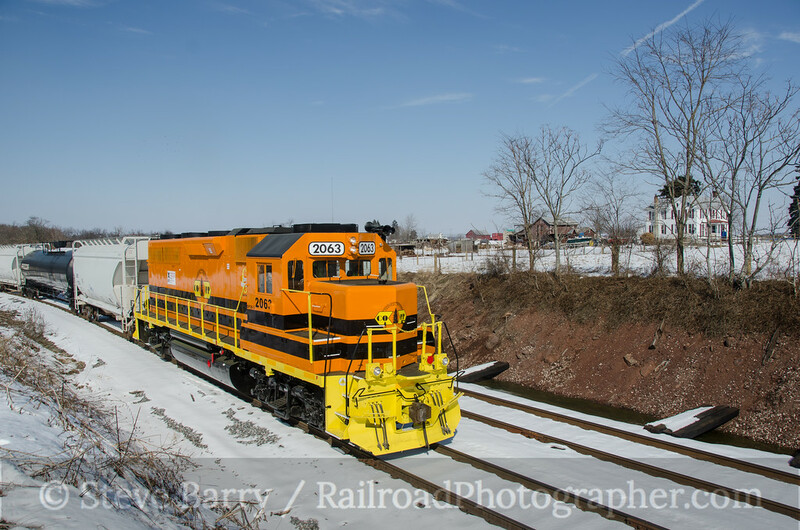 475 handled the honors on Friday, an EMD switcher provided the power on Sunday morning. Once again, ex-CN No. 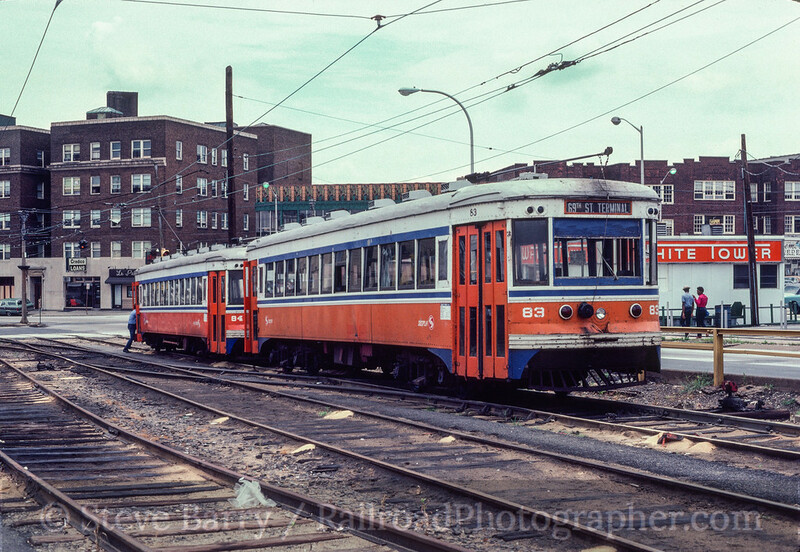 89 was powering the passenger trains. It made a nice sight from the coaling ramp in the Strasburg yard with the previous day's freight cars in the background. And we'll finish with No. 89 on a passenger run as it returns to Strasburg at Esbenshade Road. You can find more photos from the two days here. 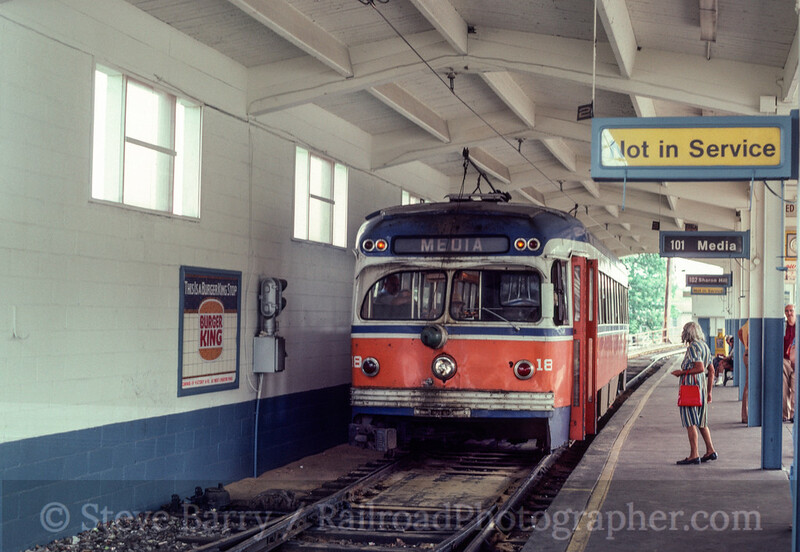 The Maryland Midland Railway is changing. 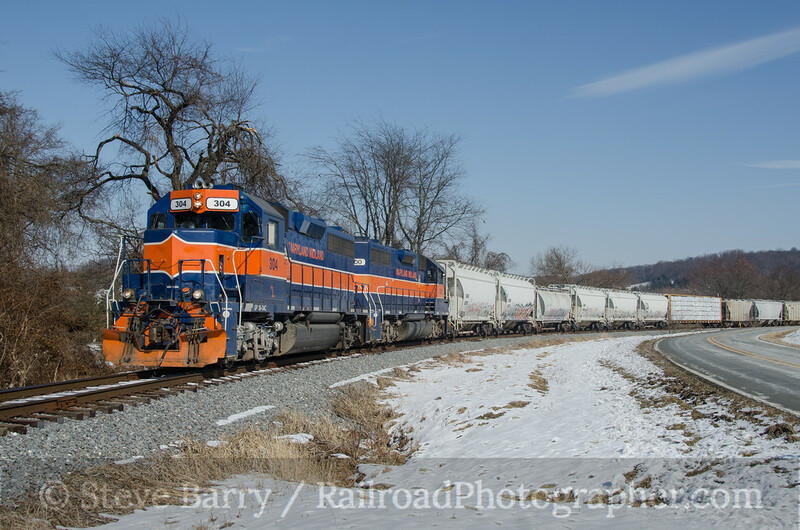 While it has been owned by short line umbrella company Genesee & Wyoming Industries since 2008, the railroad has kept its traditional motive power fleet of GP38-3s painted in blue and orange (save for one unit that received GWI corporate paint). 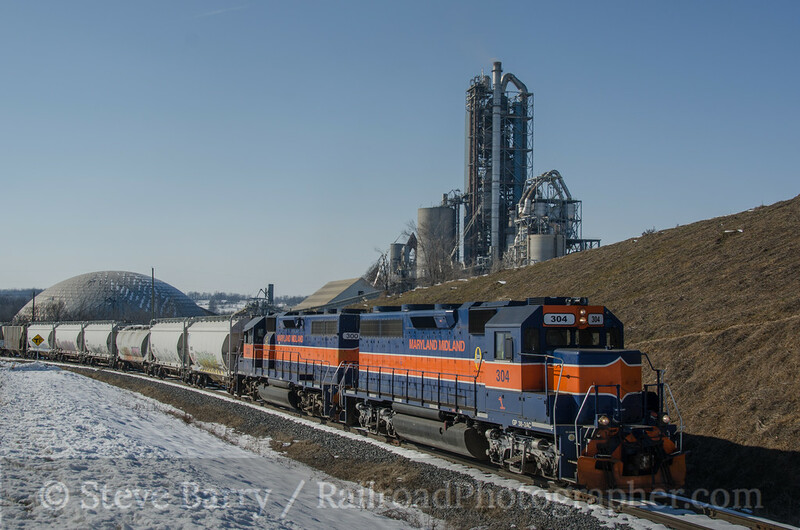 In 2014 GWI decided to shuffle motive power between railroads; much of Maryland Midland's roster was being sent west to the Central Oregon & Pacific, while MMID would be receiving locomotives from another railroad. All would be painted before shipping to their new homes. 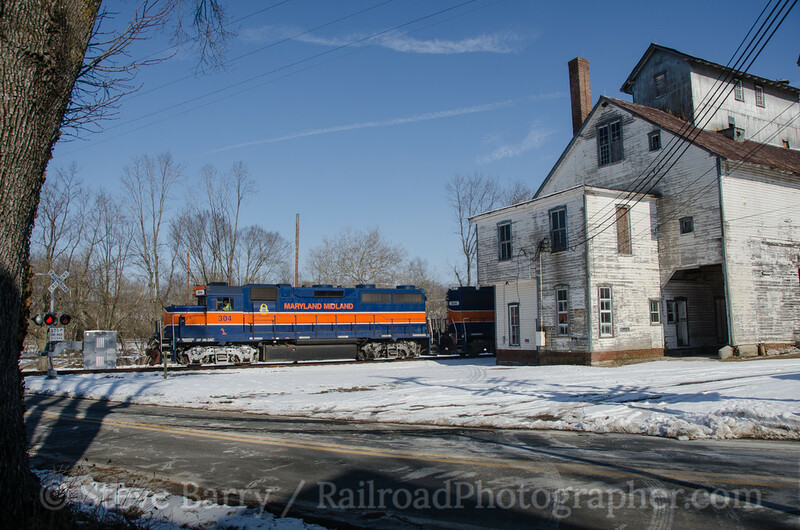 Last month I headed to the Maryland Midland to chase the train from Union Bridge to Highfield and had a somewhat difficult day (you can read that story, which also has some more details on the railroad's operations, here). 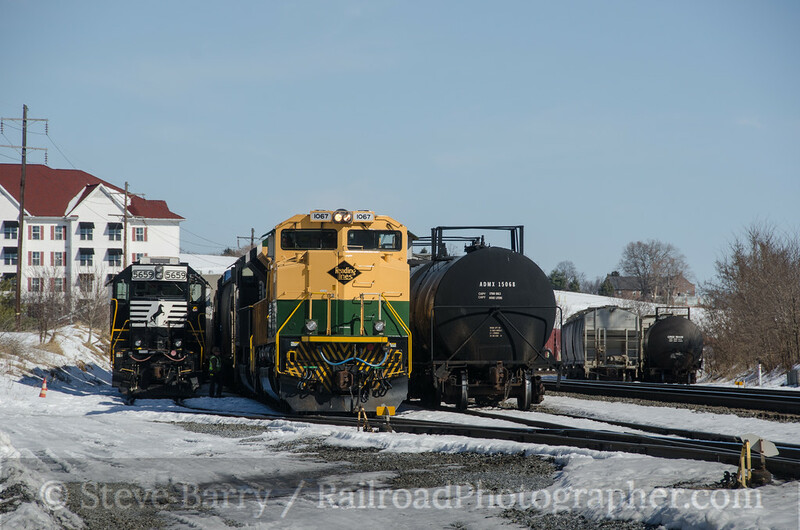 With a nice sunny day in the forecast for February 11, I met up with my brother in Maryland again, this time to chase the train from Union Bridge to Emory Grove (a Tuesday and Thursday run). 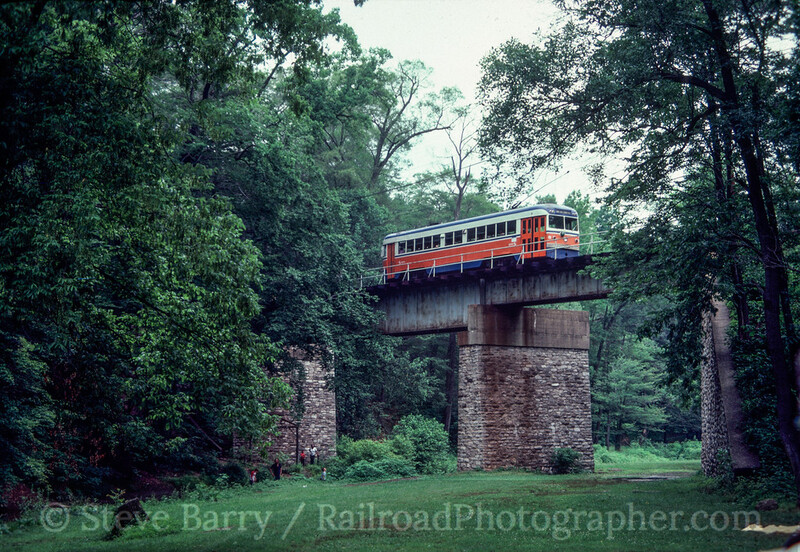 The first move was to send a train the opposite direction from Emory Grove out of Union Bridge, heading to Keymar where the MMID east-west ex-Western Maryland main line crosses its north-south ex-Pennsylvania Railroad branches. At Keymar the train headed north to Taneytown to do some switching. Leading the train was GP38-3 No. 2063, making its very first run in the paint for its new operator, Central Oregon & Pacific. 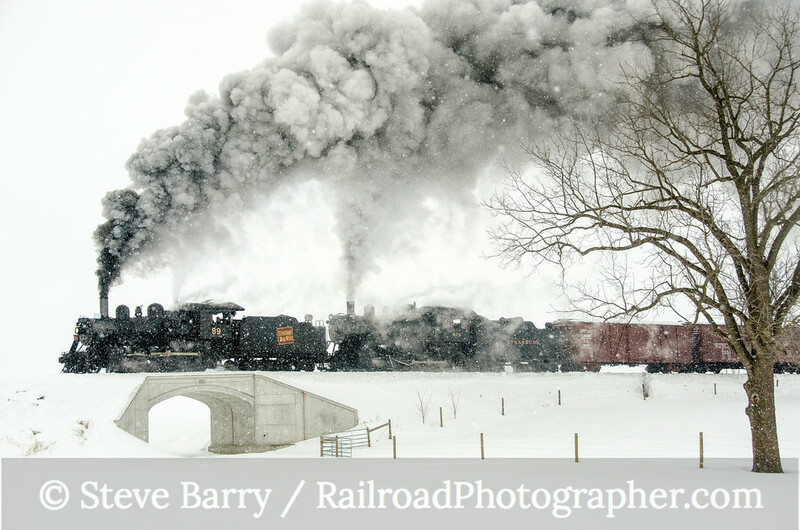 As it sat among the the evergreens in Taneytown it got a small taste of the scenery it will soon see in Oregon (above). 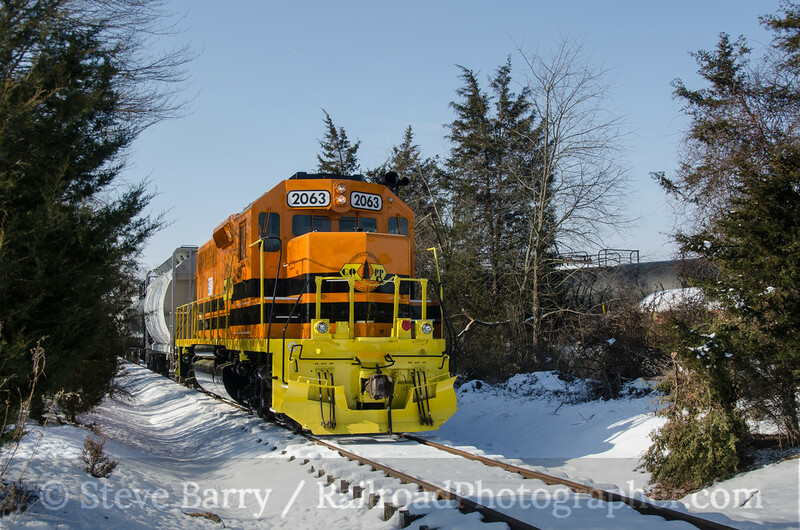 The switching took a long time in Taneytown, and more was done near Keymar. We didn't think the railroad would have two crews on, and it looked like the train to Emery Grove might not be operating. Perhaps it was another tough day for us on the Midland. 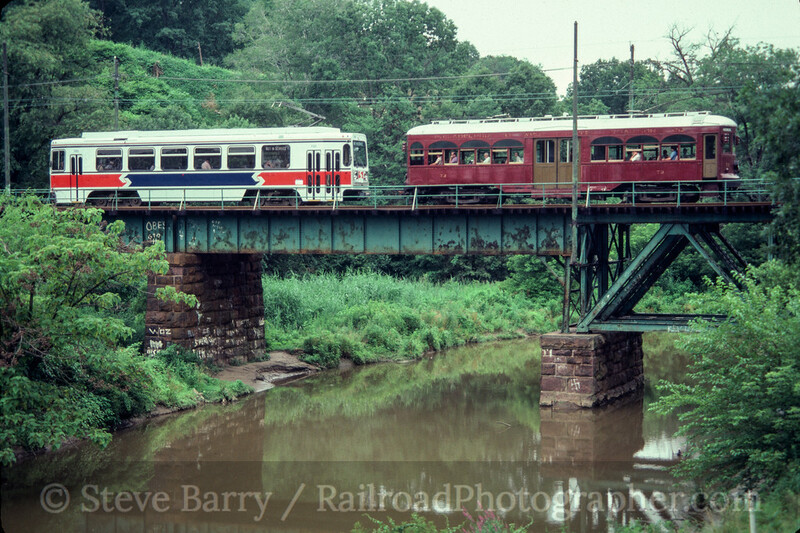 Finally done with its switching, the train swung off the ex-Pennsy and onto the Western Maryland at Keymar. 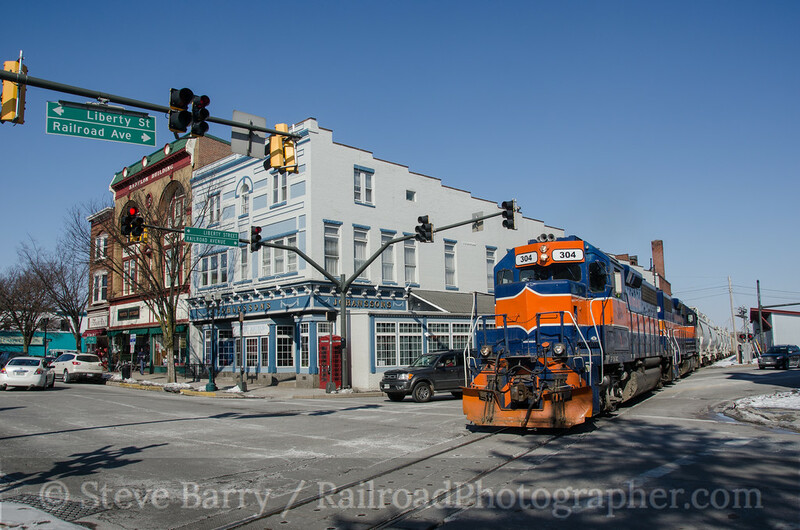 The iconic shot in Union Bridge is of a train passing the former Western Maryland station and office building. The Western Maryland Historical Society now occupies the building with an extensive collection of artifacts, a library and a museum. With the train back into Union Bridge it seemed our only hope would be for a run up to the Lehigh Cement plant, the line's largest customer and part owner of the railroad. The plant is served daily. But while waiting at the junction that leads to the plant, we caught a break. We were sitting with friend Bruce Kerr, and one of his Facebook friends posted that the Emory Grove train had just passed through Westminster heading to Emory Grove. And it had the last two blue and orange MMID units on the train! We immediately beat feet to Westminster to wait for the train to return. The highlight in Westminster is where the railroad cuts through the town's busiest intersection. 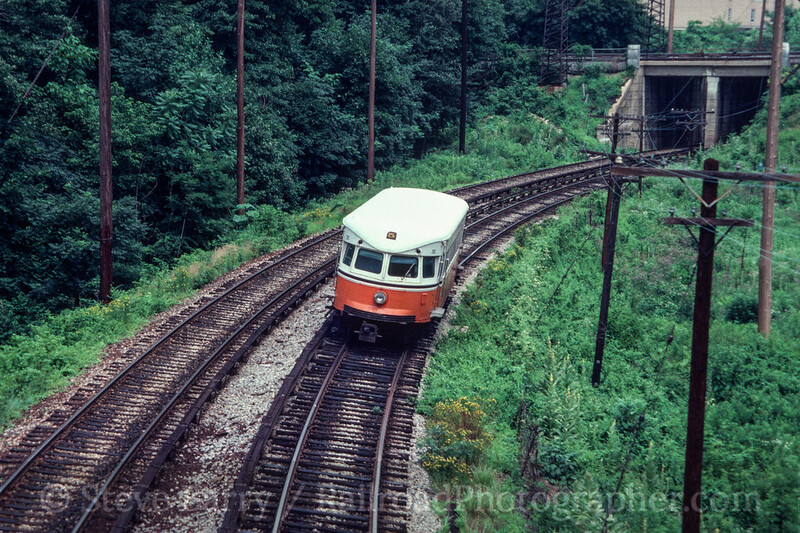 The approaching train always sends cars scrambling out of the way. With one of these two units next in line to go into the paint shop, we knew this would be one of the last trains with matched blue and orange power, so we made the most out of it with a spirited chase. We got the train again near New Windsor. A funky old building just outside of Union Bridge made for a nice scene as well. Back in Union Bridge, the train passed the Maryland Midland offices. The building is relatively new construction, but done in an old-ish style. It is directly across the street from the old Western Maryland station. Finally came the daily run up to Lehigh Cement. As said above, one of these two units will receive the GWI corporate colors and be sent on its way to another railroad. 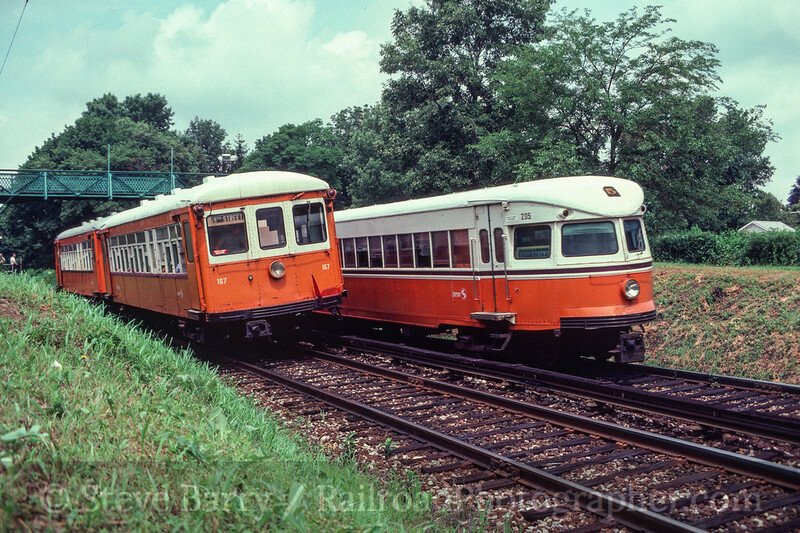 However, it is reported that the other of this pair will stay on the Maryland Midland and stay in blue and orange paint as the railroad's "heritage unit." More photos from this day can be found here.